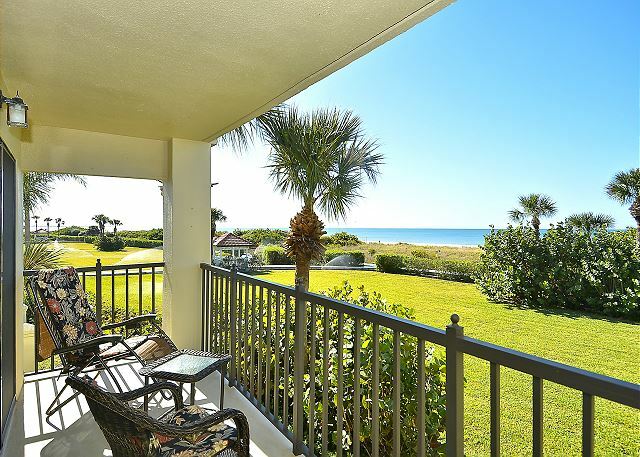 This beautiful south corner has a sweeping view of the beach and the Gulf of Mexico and the pool from the double size balcony. Rows of windows open the space to an expansive view of beach from the living room, dining area and the kitchen. This condo was totally remodeled and has a beautiful open kitchen. 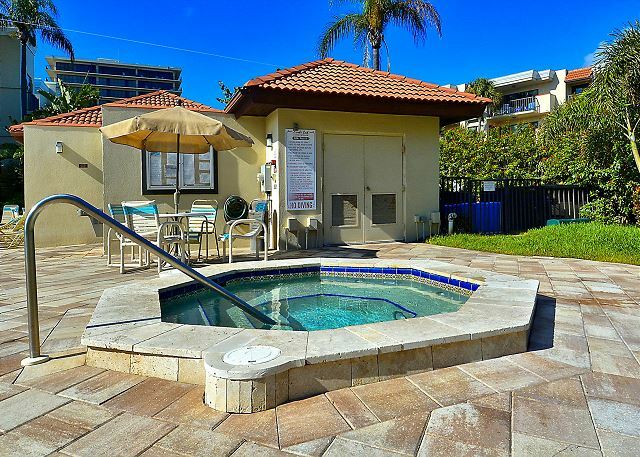 Located in the popular Sunset Beach neighborhood, this lovely condo has free wireless internet service. a guest from Columbia, TN does not recommend this vacation rental. We have stayed in many units in Land's End. It's hard to not compare them as we go along. Overall, it was a good stay. There were many things that disappointed me. Upon entering, I expected the same great view of the water AND the beach. The view was mostly blocked by the tall bushes by the boardwalk then the brush on the other side of the boardwalk. So many of the cabinets and closets were locked by the owner which is their right but reminded me that it was not my home. I don't think it would be amenable for an extended stay. Lastly, the master bath could really use a deep clean. That being said, it is Land's End which is a premiere property for the location and privacy. I'm sorry but if there is another unit available, I could not recommend this one. Thank you for your feedback from your recent stay. We are sorry to hear if things in this location were not as you were expecting. This condo provides lovely beach views but you are correct, there are areas that have higher growths of vegetation. The exact views from each of our condos can be found on the "media/floor plan tour" area on our website; if there is vegetation in place it can be seen there. We want to present the condo and views as accurately as we can and the exact views from this condo are shown for all. In regards to the locked cabinets, we are sorry if this caused you any discomfort. Many of the owners do keep an area of their own personal items locked up in the unit, this is for their convenience as they come and go from their homes in between rentals. This is a nice condo with some lovely updates, if they were not the right fit for you we do have others. Thank you for being our guest and we hope to have you back for a future visit. Our time was great there. A Quality vacation experience !! I have been coming to Lands End for over 20 years. I have to say that this unit is one of the finest units with a spacious open concept that provides a comfortable feeling. 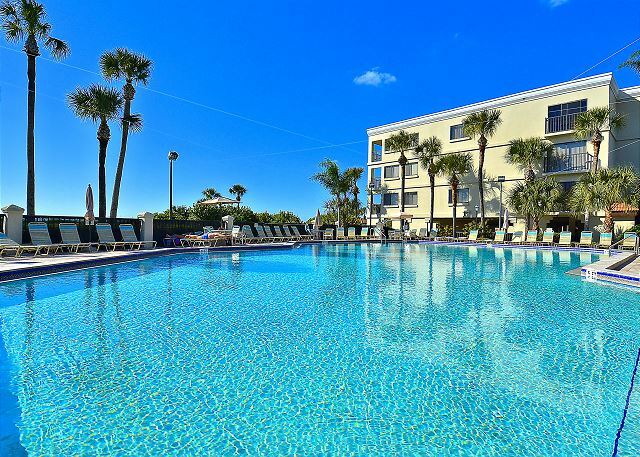 You have a gorgeous view of the Gulf and a clear view of the pool which only a few units provide. I enjoyed several views of dolphins right from my balcony. Lands End is the finest property on Treasure Island. There are several great restaurants within walking distance of the complex. You are guaranteed to enjoy your vacation and I look forward to my return. Wonderful! We are so glad you enjoyed this premier beachfront condo in our inventory, the owners really did a great job with the updates and we are glad you liked it! The condos in the "01" stack do give you a wider balcony area and different floor plan layout and we are glad it worked for your stay! Thank you for choosing to stay with us and we hope to see you back for many more visits. We travel with multi-generations. The unit was very nice and welcoming. We had a problem with the AC due to workers on the roof damaging wiring. We called and it was taken care of promptly. The only negative I would advise other renters about is that this unit did not have adequate beach furniture. Flying in from far away and being excited about going to the beach each day, my experience has been that beach furniture (at least two chairs and an umbrella) would be available. I called and was told that not all units have beach furniture. They should. I realize that it would be damaged over time but it would be appreciated by the guests not wanting to trek to the office and pay a $500 deposit. Our family in Tampa was kind enough to bring us over beach furniture when they came, but it would have been icing on the cake to have it in the unit. That is a reasonable request at this price point. We are so glad you all enjoyed this premier condo in our beachfront category at Land's End. A majority of our condos will provide beach chairs, umbrellas and other beach items; however, that inventory is constantly changing as many times items go missing or become unusable. That is why we keep a supply here so that we can help should you not find them in the unit. We do not take a $500 deposit, just a $50 deposit for 2 chairs and an umbrella and upon return of the items we give you the $50 right back. We are sorry if you found this to be an inconvenience to your stay but we most certainly can help with this. Outside of that, we hope you had a great time with your family and hope to have you back to this awesome property in the future! I had to clean the apartment on my first night as it was very dusty and I found 2 dead roaches by the sofa. I called for service and 2 ladies came the following day and did a good job. In addition had to change 2 bulbs that were out and clean washer in order to use it. Units should be verified before guests arrived in order to make sure they are clean and completely functional. Guest should not have to waste time cleaning, to make it habitable, while in vacation. I complained to Resort Rentals and I am still waiting for a phone call from the Manager. Apartment view was beautiful. We are truly so sorry that things were not up to par upon your arrival. You are absolutely correct that you should not have had to spend even one minute with these items on your vacation and we have discussed this with our housekeeping staff. Please accept our apologies on this matter and know that it has been addressed with them. As for our untimely follow up to you, we are sorry it took us a few days to get back to you, we never intended for it to seem like we were not getting back to you; we were just speaking to all that were involved and it did take a few days and we are sorry for that delay. Thank you for letting us know about this, we really appreciate that and hope that this will not be an issue for you or anyone else moving forward. Thank you for being our guest at Land's End and we hope to see you back for another visit in the future. Our stay was like all the others ( GREAT ).we just love staying their and would NOT stay anywhere else.The staff is Great and will do anything they can to make your stay perfect. Can't wait to come back next year !!!!!!! We enjoyed our stay in Building 10. Land's End is a great location for a relaxing week on the Gulf of Mexico. Awesome!! So glad you enjoyed your stay in this premier condo at Land's End and we hope to see you back for another visit soon! Nice big family room area. Facilities needing some minor age related maintenance. Looks like dredging equipment parked off shore the whole week we were there. Beach in this location is a little shelly, not soft fine sand. Not within walking distance to anything. Thanks for your feedback. Yes, the Land's End location is a bit off of the main road of Gulf Blvd. but that is what keeps it nice and secluded! 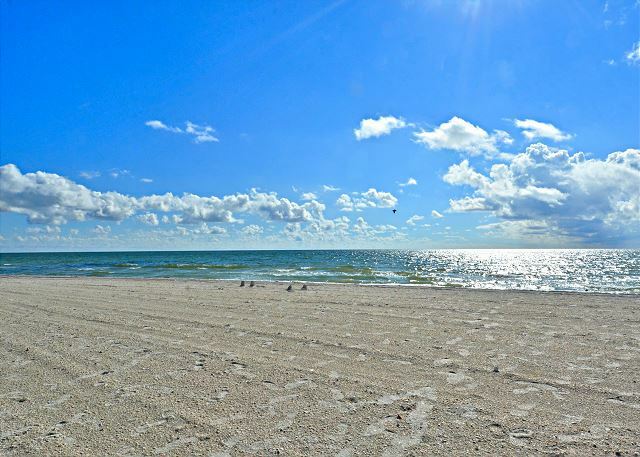 :-) The city is currently doing a beach restoration project on St Pete Beach, you probably were seeing their equipment that was parked out in the waterways and we are sorry if that was any disturbance to you. We hope you enjoyed your overall stay and that you will come back to our area for another visit. We are so glad to hear you enjoy your time in this condo at Land's End!! :-) Thank you for being a repeat guest with us and we look forward to the next visit!! Outstanding. 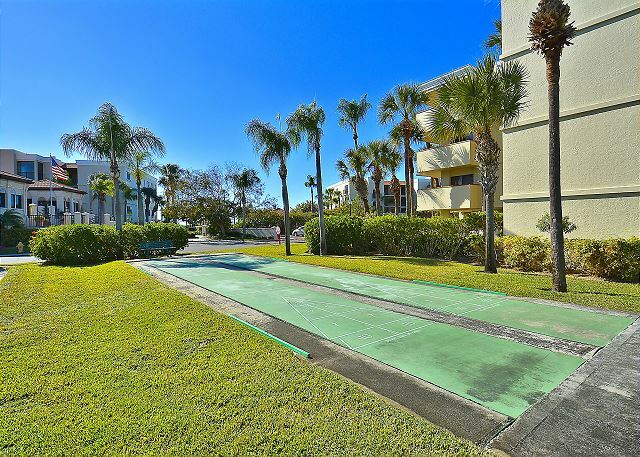 Large two bedroom two bedroom condo with beach and pool views. Great sun rise and sunset views. 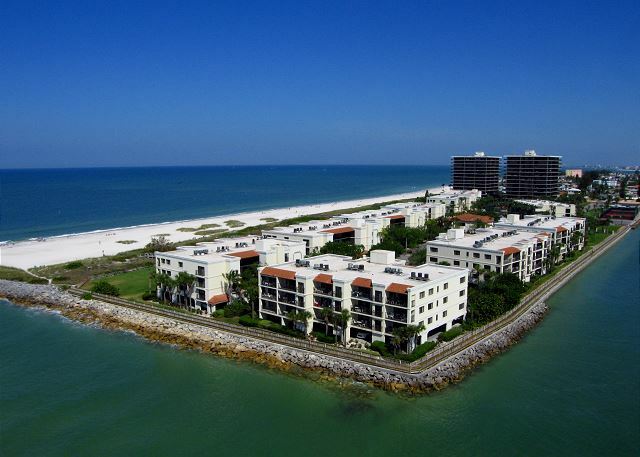 Great to hear that you enjoyed this newly updated beachfront condo!!! :-) Thank you for choosing to stay with us and we hope to have you back for another visit! We've stayed in this unit several times now. We love how it's been remodeled to be good for entertaining. One caveat is that it is often necessary to ask Resorts to have someone come out to fix small things, They're very responsive tho'. Thank you for this post and we are happy to hear you like the updates that have been done!!! :-) We apologize for anything that may have needed an adjustment while you are here but thank you for calling us so that we can address it for you. Thank you so much for being a repeat guest with us, we enjoy having you and look forward to the next visit! I have vacationed at Lands End for a long period of time. I truly enjoy staying in this unit. It is beautifully decorated giving a warm and home like feeling. The unit is bright and spacious with an open concept numerous large windows and large balcony. You will enjoy a beachfront view of the beach, gulf and will see dolphins almost daily from the balcony. The sunsets from this west exposure unit are truly picturesque. I believe this unit is one of the true gems at Lands End. There are also excellent restaurants within walking distance and also a short drive. We love it!!! :-) This is one of the condos that fall into our premier category carrying recent updates and the owners really did a lovely job! So glad you enjoyed!!!! Thank you for being our guest and we hope to see you back for another visit soon! We just love the condo, Great view big rooms and a big pool. The people working thier are very nice, if you need anything they are happy to make your stay as nice as possible. This was our 10th time and we will be back. Thanks Resort Rentals for making our stay GREAT. !!!!! You are so welcome!! And really thank you to the owner of this lovely, premier condo that they provide!!! :-) Thank you for being a repeat guest with us, we truly value you and are looking forward to many, many return visits!!! No pantry space in the kitchen area for groceries. Some cooking pots/pans were in bad condition, need replacing. Other than that our visit was great, the condo was very nice. Thank you for your post and feedback on this Land's End condo, we will be sure to pass this over to the owners for review. If you are ever in need of any kitchen supplies (such as pots/pans) please just give us a call at our office and we would be happy to help with that! :-) We keep a number of frequently asked for items here at our office and we are more than happy to swap out a pot/pan for you if needed. Outside of that we are so glad you enjoyed this condo and had a nice visit and we hope to host another vacation for you in the future! So great to hear!! This is a very nicely updated condo in our program and we are so glad you enjoyed!! The corner units do offer a larger balcony area and a sightly different floor plan and we are glad you tried it and were happy with your choice! :-) The owners of this condo do a great job with the supplies they leave and we again are so glad it was a good fit for you! Thank you for choosing to stay with us and we look forward to your next visit to Land's End! From start to finish all went well for us. The weather cooperated, the accommodations were awesome, comfortable and everything we expected. Our view of the pool and beach were wonderful. This unit is spacious and had everything we needed as a family. We had a total of 13 people spread out over 4 condos. This one was the gathering place in the evenings for family games, etc. The view (although acceptable) is not the same as the higher condos, but the convenience of being so close to the ground floor and the roominess made it perfect for the family of 4 (2 small children) staying there. It was quiet, too, not at all noisy, although very near the pool. The location,condo and weather was great. 3 wonderful things to hear!!! :-) So glad you had a good vacation and we look forward to your next visit! We arrived the office personal could not be more helpful. The condo was ready for us, it was spotless. We could not have been happier. We love Lands End. And will never use anyone else. on the floor and rugs. Thank you for your feedback. We are glad to hear that you enjoyed the Land’s End property but do apologize if you experienced any problems in regards to the kiddos. It is true that the community of Land’s End does have some rules and policies in place; however, we are so sorry if there were any issues outside of that that. Please do not hesitate to contact us if you feel there is anything out of sorts or makes you or your family feel uncomfortable while you are staying. We want all of our guests to have a wonderful vacation experience and please just call if we can assist with anything. In regards to the cleanliness of the condo, we do apologize if things were not up to par and we will/have discussed this with our cleaning staff. Again, please do not hesitate to call us with any issue and we are happy to have our staff come out and get things as should be. Thank you for staying with us and we hope to see you back again soon. We have rented through Resort Rentals before, and both times we've had good experiences. Their key pick up location is convenient, and units are as described. This particular stay was for 8 nights. This is a large, premier unit on the lowest floor, beachfront. 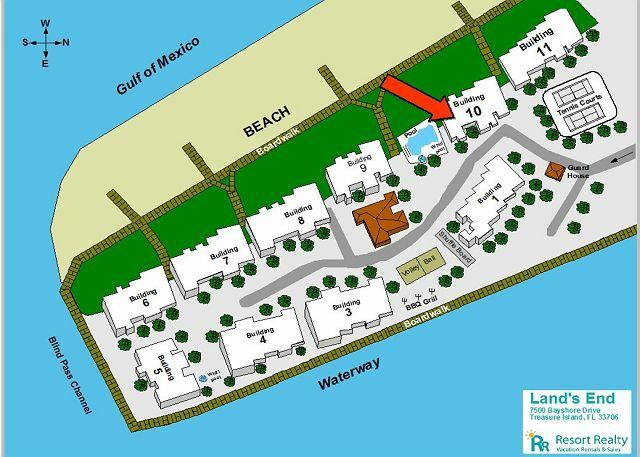 Bldg 10 is centrally located next to the pool and two beach walkovers. We actually loved the location. The door to the unit was right next to a stairway too - very convenient. We heard zero noise from any other units the entire time! The interior was decorated traditionally with a mix of high and low end furniture. The master bed was very comfortable, as was the huge couch, but the chairs indoors and on the patio were a bit stiff to sit on. The ocean view was amazing, and the sounds of the surf could be heard when the sliding doors were open. A few issues we noticed: a sizable rip in one of the screens, meaning we couldn't open that set of sliding doors. The toilet in the master bath had to be fixed after each flush or it just kept running. The kitchen was lacking sharp knives, a juicer, storage containers, and a trashcan! BUT... none of these issues were important enough to report, and the positives completely outweighed these minor issues. The unit was stocked with beach chairs, an umbrella and floating toys, which was convenient. Water and beach at Land's End are amazing! And the complex is within walking distance of Caddy's on the Beach and KaTiki, both of which are must-do hangouts! As far as near-by attractions, we loved the Mad Brewing Co at John's Pass for food and beer and Ft. DeSoto Park for biking, kayaking, exploring, swimming, eagle-watching and beach combing. Thanks so much for the post! We are thrilled that you had a good stay at Land's End in this premier condo and that you enjoyed the area attractions! We do apologize for the maintenance items that you had listed but were glad to hear they did not outweigh the positives!! :-) Please do not hesitate to contact us on any of those listed items as we do have staff in place to address anything that may come up. We want to be sure you are completely comfortable in your rental while you are here so please, just give us a call! :-) Thank you so much for being our guest and we look forward to your next Land's End visit with us!!! We've rented this condo for multiple years, 2 weeks over Thanksgiving. 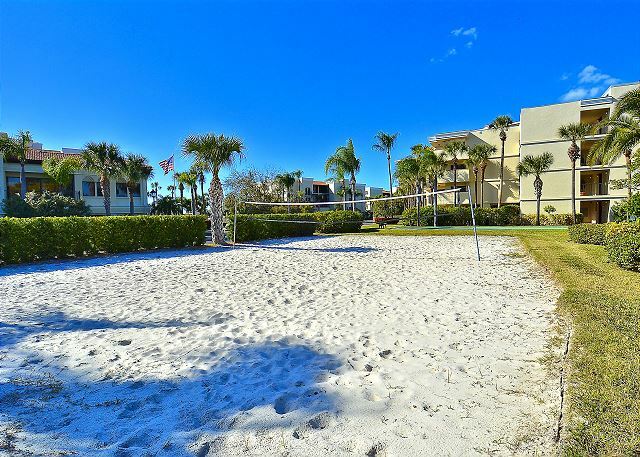 We've tried different properties on Sunset Beach and this is our favorite. This condo is as described and photographed. It is well-maintained, although there are always a few things that need correction after it's been less-occupied over the off-season. We've brought other friends to stay in the 2nd bedroom and it's comfortable for them too. Sunset Beach is the best! Just don't plan for Thanksgiving! We stayed for 4 weeks and had a great time. The.condo was well equipt and clean. The pool was heated and very well maintained. It's a beautiful location, very quiet which is what we wanted. The rental company were excellent, very accommodating. The only issue we had was that the master bed linens were too small for the bed and felt thin and cheap. Thank you for your post! We are so glad you enjoyed this premier condo at Land's End and thank you for the kind words regarding our staff!! :-) We do apologize for the sheets and if they were not comfortable for you. We do have additional linens here in our office and we are happy to bring over a larger size, if that is what could have been part of the problem. Our linens are supplied from an outside company and will be sure to pass along this feedback to our housekeeping department. Thank you again for being a guest with us and we hope to see you for another visit soon!! We've been coming to Treasure Island and Lands End for many years and this was one of the best properties we've stayed in. Expansive views of the Gulf. Plenty of room. Convenient to the beach. Always enjoy our time on Sunset Beach. Unit was nice, but 2nd floor unit didn't provide the views we wanted. Minor issue: For the price of the unit, the cable should be upgraded to High Definition. Unit leaked water through the side window during tropical storm. This is not completely unexpected based on the age of the unit, but I hope owner is made aware. are very protective of the pool. The condo has nice open floor plan and accouterments. The view from the balcony is great. There were burnt out bulbs, the balcony latch didn't work, and I killed a big palmetto bug (Florida roach). I think it needs updating for the price. Thank you for your feedback. This unit has gotten an update since you last stayed, we hope you will return for future visits. We have been staying at this property and unit for 20 years and just love it.we enjoy it so much we are not interested in any others. The unit we stay at is beautifully decorated and is in a prime location on the grounds. Special thanks to Gail at Resort Rentals. We stayed in this unit at the end of July and the unit was clean and ready for us at check-in. The management staff was prepared for us and had all the paperwork and keys ready when we stopped by to pick up the keys. This unit will comfortably sleep 4 with the bedding and a couple of kids could sleep on the sectional couch. The unit was well equipped with pretty much any cooking gadget you will need as we made several meals during the course of our stay. It was nice also to have a couple of boogie boards, beach toys, and chairs in the unit. The management company provides starter paper products to get you going so you may want to pick up extra paper products when you stop at the store. Bath towels are provided but you will need to bring your own beach towels. Mark the gate attendant was very friendly when we interacted with him and was comforting to have someone around that you could ask questions of. The grounds of the complex were well kept up and the pool was clean and refreshing. 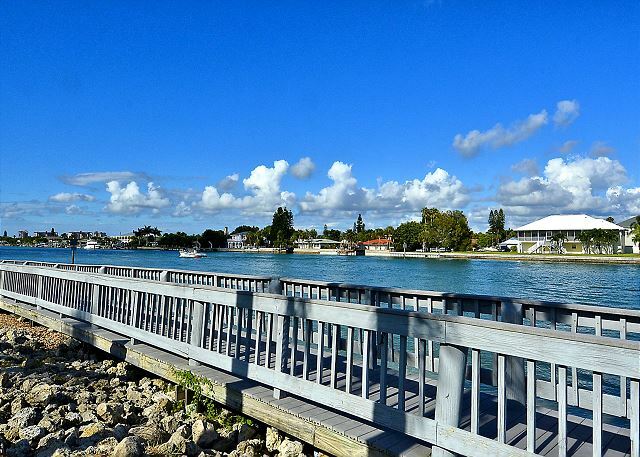 This unit is in the center of alot attractions including boating, beaches, restaurants, water sports. I would recommend that the owner consider replacing the patio draperies as they look a bit worn from use. We hope for the opportunity to return and would rent this unit out again! Great place to stay , clean , great pool , friendly people , our condo was updated but need new dishes to go along with it . Dishes were out dated .didnt go with the decor. We have rented through your company at Land's End several years and it has always been a very good experience. There are a couple of minor issues that I think would improve your marks on customer service. If you could just provide enough trash bags and bath soap for the week, it is a small but irritating issue. The unit we were in needed some updating just in decor and furnishings but had the most wonderful view of the gulf. Our vacation rental was perfect. There was plenty of room on the balcony with seating for 5 people. The beds were comfortable. Everything was clean and well cared for. The view was pretty. Resort staff was friendly and helpful at all times. We will be back to vacation here again. 3 families travelled to Treasure Island and stayed within the Land's End Complex. It was perfect. We had 5 teenagers and the safe environment let them roam freely. The beach is one of the best and is very private and not crowded. It is a bit of a hike to restaurants but one call to Free Beach Rides and we were wherever we needed to be. Our condo was great. Nicely upgraded and the layout was open and accommodated our large group for drinks and snacks. If booking, make sure you look at the pictures and reviews of each unit. Our friends did not have the nice layout and updates that our unit had. Check in was super fast and Resort Rentals was just a call away if we needed anything. Would head back there in a heart beat. Also, there were lots of posts about issues with the pool. We never encountered any issues with our kids being in there - everyone was very friendly. A great time and overall a good experience. We've rented all the varieties of units in Lan's End over the years and love this unit best. We loved the double balcony and the corner location. We had a family gathering over Thanksgiving and were able to make 13 people comfortable in the living room. Have already reserved for next year. I have been coming to Lands End for 20 years and specifically this particular unit. I have enjoyed my vacations here immensely and look forward to many more. We had a Great time. The condo was everything we expected and more. It was very roomy and comfortable. We loved the lay out with all of the windows and the double sliding glass doors. The views were breath taking, and sun sets were priceless. We will be back for lots of years to come. One our best vacations ever! Land's End is absolutely the best place to vacation on the Gulf Coast! The rooms are always neat and clean, and have everything you need. I've been vacationing at Land's End for almost 20 years and this year was one of the best. Building 10 room 201 is simply gorgeous and has the best view of the ocean. It overlooks the pool and beach! Overall, a great vacation. The condo is nicely updated with granite countertops and nice appliances. The grounds are maintained exceptionally well! The pool area is very nice. We will definitely return to this unit!!! We have vacationed in titis area for the past 10 years and just love the tranquil beach with access to local places to eat and drink. The grounds are beautiful and well managed to avoid loud tenants. Great location & great unit! We loved everything about Lands End. At first we were a little concerned about the "strict pool rules", but everything was just fine for kids that were 5 & 9. We absolutely love this condo! Amenities, view, style. Perfect. We would love to go back again soon. Beautiful property and unit. A perfect place and one we have visited many times. The location really works for us and the apartment we stayed at this time was the best we have been in. We will be back again in the future. The staff at the complex could apply more common sense on occasion where 'pool rules' are concerned. Our lads are now older but there were a couple of young children disturbing no one and playing a game in the pool which was stopped. I understand if others are being disturbed but when it is the only 2 in the pool and a ball is not landing on other guests I think common sense can be used. Otherwise a really fabulous time and just sorry to be leaving. Thank you for the great holiday experience. My family has stayed at Lands End for years and have always enjoyed this beautiful property. We just love the beautiful unit (201) building 10. We come to Madeira Beach and Treasure Island 3-4 times a year. Land's End is by far our favorite place to stay. The property is unbeatable - beachfront, lush green grounds, long waterfront walkways, nice pool, and quiet!! This particular unit was one of the best we've stayed in. Very nicely remodeled and furnished. Spacious living room with loads of light and beach views! We highly recommend it! 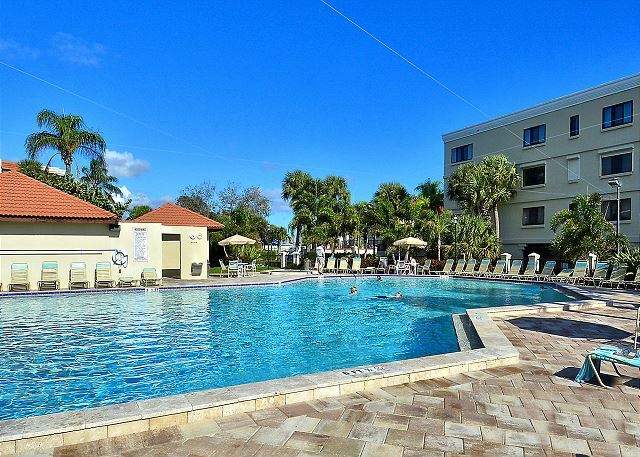 Beautiful spacious condo on beach and close to pool. loved it, couldn't have had a better time, thank you! Nicest condo we have stayed at!Spacious and nicely decorated.Great location and very nice beach area! Beautiful grounds and pool area.Would definitely come back here again. We have stayed at Lands End several times. This is our first stay in this paticular condo. we can call Resort Rentals for any needs or concerns and they are most helpful and address any needs immediately. You won't be disappointed. My family enjoyed this beautiful property and look forward to next year. Our family had the most relaxing and enjoyable vacation this year at Land's End resort in unit 201 of building 10. Our unit was wonderful with beautiful decor and it was very clean with updated furniture, TV's, appliances and the bathrooms and kitchen were very nicely updated. The views from Land's End was the best we have ever had since we started coming to this area 13 years ago - we all agreed as a family that Land's End is the only place we want to stay at when vacationing in the Treasure Island area. Thank you for a wonderful place to stay at - it was everything we wanted and more, we will be back soon. We stay at Land's End every year and this year's unit was amazing. We will be back in 2013! The unit was nicely equipped (could have used a better sized strainer), nice furniture and a great view/ location. Did have some sand on counter tops (cleaners may have over looked), but cleanliness over all was good. My only concern was, if you have some one visit you its a bit of a hassle, even if proper paper work is filled out and handed to security at the gate. But, our overall stay was wonderful.